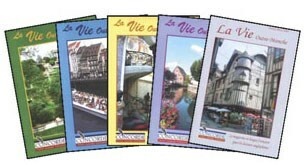 La Vie Outre-Manche is Published every two months. Full colour. 40-44 pages, A4 in format. Les bas prix, une arme à double tranchant? Enjoy listening to selected articles from the magazines - and learn French more quickly. Enjoy well-written and well-spoken articles either at home or on that journey to work. There is a quality audio CD or cassette to accompany each audio magazine issue as an optional - but recommended - extra. It contains clear recordings of selected articles. There is also Écoutez et Parlez: pronunciation and dictation exercises to help you even more to improve your French. Partir ou pas cet ete? La est la question.